Resolutions. What kind of resolution would a used bookstore want to make? Post more books online, is one thing. Make a conscious effort in blogging and better represent the books that enter the store. Feature them. Write about them. Maybe work towards creating an inventory of the books? And how about this one…read. Yes, read. I’m giving myself permission to read when the store is open. Well, that’s crazin ess, you are probably thinking. You think I read all the time. No. I don’t. 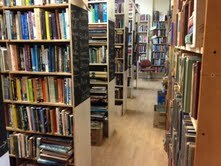 Actually there is a lot of work to do in a used bookstore. It can be what you want to make of it. I chose to be – or try – to be on top of the incoming books. By now you know that I don’t like boxes of books lying around. Especially me. So I try to go through them quickly to SPS (sort, price, shelve). But lately I’m finding myself not so intense about them. Am I getting lax? Maybe so. Or maybe I’m starting to feel more comfortable with the store and relaxing some. Something to ponder, if one so chooses. There might be more to the list but for someone who doesn’t make New Year’s resolutions I think that it’s a lot. So with that…here’s to an awesome 2013!